When I used to work in Boston’s Back Bay (my favorite part of the city!) I would go to Shawarma King in Copley Square for lunch and it was always so good. It always seemed to be crowded and that was for a very good reason. The shawarmas were always so good and full of flavor. I would stand in line, usually with my co-worker and friend, Jennifer. Because it was the 90s, we probably spent our time in line talking about Hanson and confessing that we actually like “MmmBop” (sorry, Jennifer!). Or talking about the latest Princess Diana commemorative edition of any magazine. Or maybe it was a pair of shoes that I thought were fashionable, but looked like clown shoes to everyone else. OK, in hindsight they were pretty hideous, but being the 90s, I get a bit of a pass, right? I am pretty confident though that Jennifer and I did stand in line trying to pronounce “shawarma” in the goofiest way possible. “Shhh-aaa-waaaaarm-ahh” was probably the most popular and was kind of like the extended remix version. Obviously, this was a result of us being overworked and/or waiting too long to have lunch that we became delirious. We always laughed a lot and it made waiting in line for shawarmas worth it. Jennifer and I would go back to work, flip through our Princess Diana commemorative edition magazines and enjoy our shawarmas. I’ve been thinking of good times like those with Jennifer, and inevitably they have me hankering for chicken shawarma. Shawarma King in Copley Square is long gone so that’s not an option. I know that there are other shawarma restaurants in and around Boston. But rather than me walking aimlessly around the city looking for good chicken shawarma, I thought, why not try to make it at home? But I’d have to do it without a spinning rotisserie that’s taller than me. 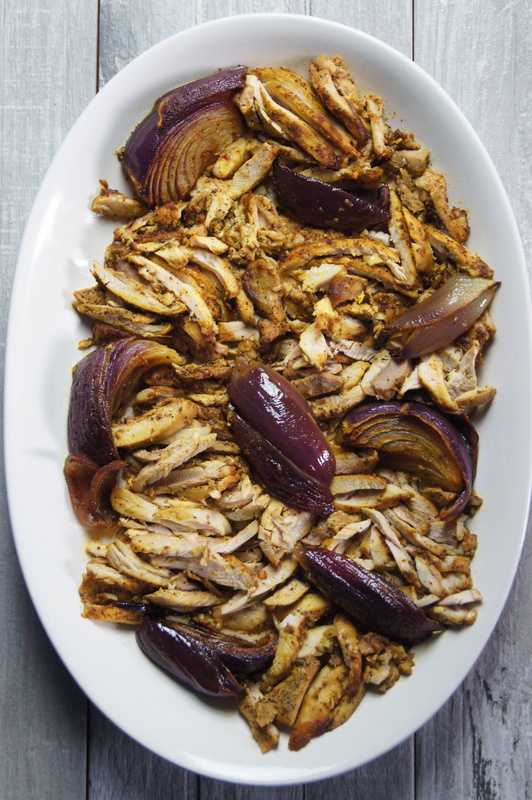 And that’s totally fine because I have my awesome sheet pan to make this delicious chicken shawarma. It literally can’t get any easier than this. You marinate the chicken in a combination of amazing spices – including turmeric, which is so good and good for you – and olive oil a few hours or the night before. 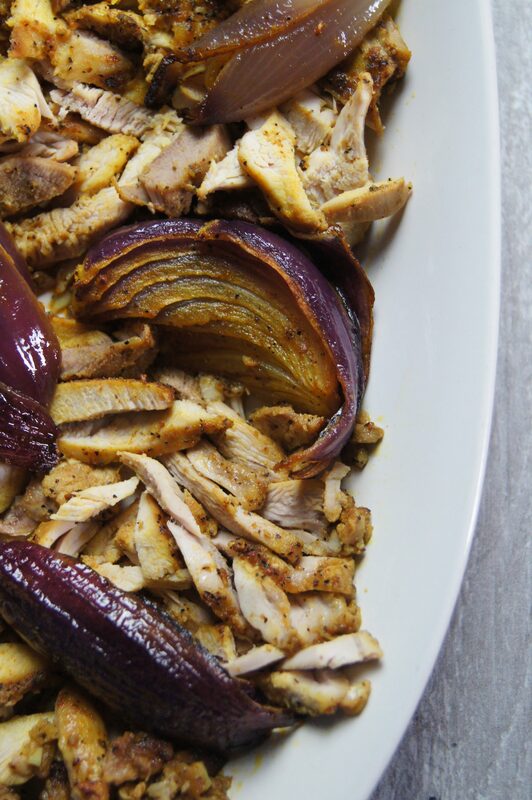 Then when you’re ready, you place the chicken and red onions on a sheet pan and let it roast for about 35 minutes. The smell of the chicken and the spices as they’re roasting are simply amazing. Even more amazing is the taste. There is so much flavor here it will blow you away. 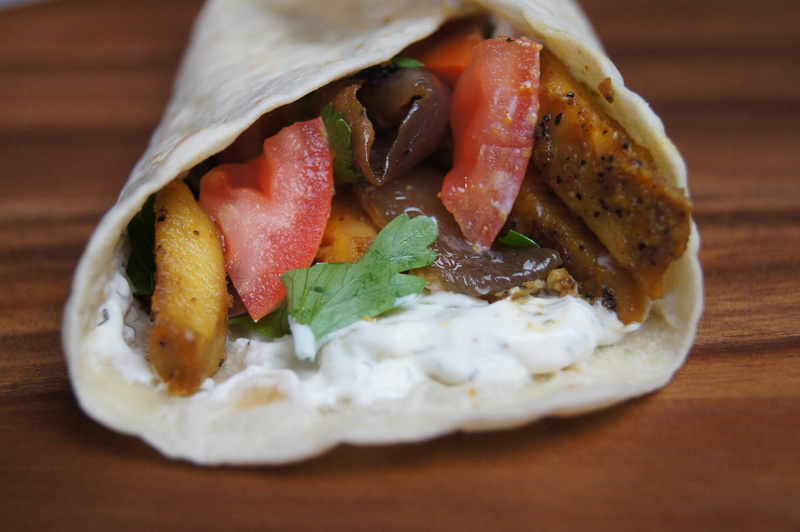 I love that you can have this chicken shawarma any way you want it. The first time I made it I served it over rice pilaf and it was a great combination. I would do it again with cauliflower rice. And just as good was having this chicken shawarma in a tortilla or pita with tomatoes, a sprinkling of parsley, and tzatziki. 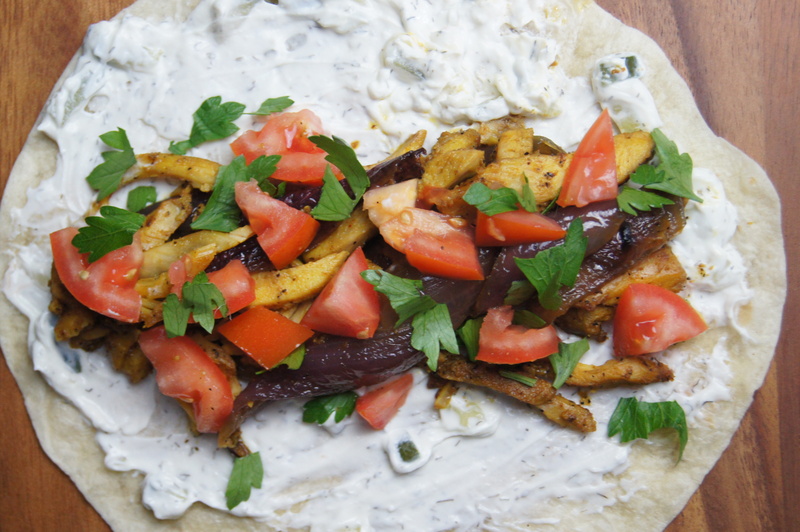 I make my own tzatziki, which is pretty addictive (http://www.thetastypage.com/chicken-souvlaki-lemon-oregano-marinade-tzatziki/) or you can buy store bought (Cedar’s makes a good one). It would also be great on top of simple green salad. 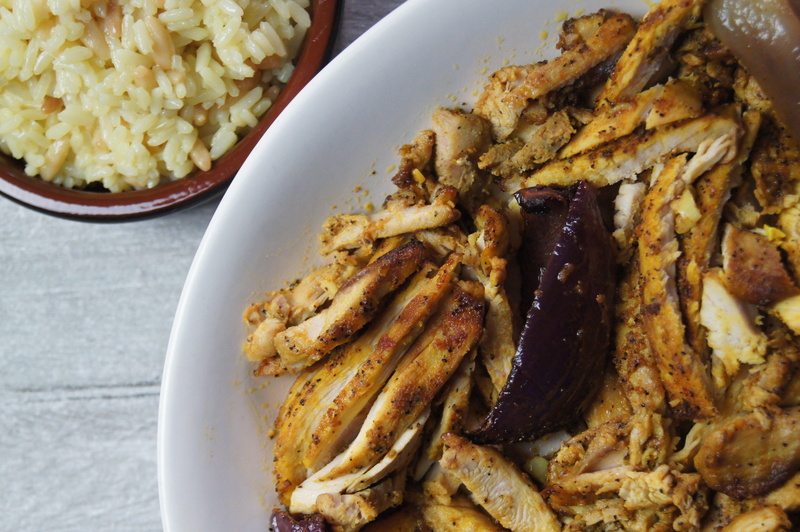 This chicken shawarma is great for meal prep too and you will definitely not be having any sad lunches at your desk during the week. 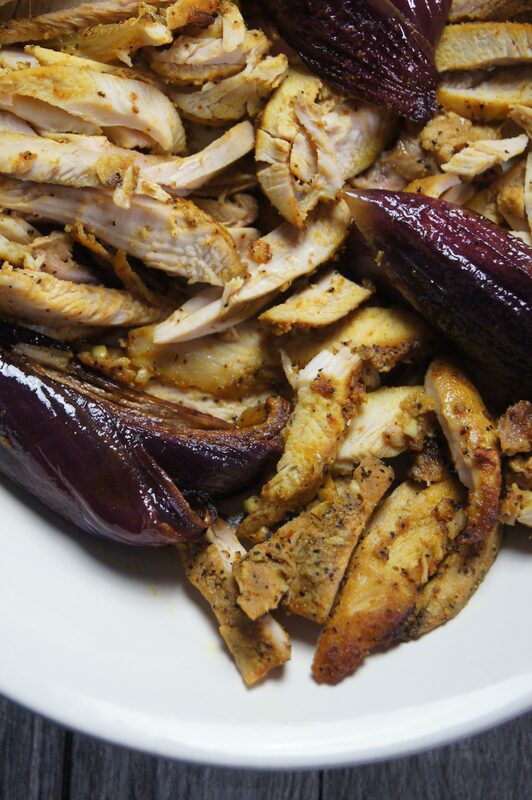 To me, this chicken shawarma is comfort food. It tastes incredible and reminds me of happy times. It’s always a nice feeling when you enjoy a meal that makes you smile and has such an incredible flavors. Prepare a marinade for the chicken. Combine the lemon juice, 1/2 cup olive oil, garlic, salt, pepper, cumin, paprika, turmeric, cinnamon and red pepper flakes (if using) in a large bowl, then whisk to combine. Add the chicken and toss well to coat. Cover and store in refrigerator for at least 1 hour and up to 12 hours (I recommend marinating overnight). Sprinkle with parsley if desired and serve with rice pilaf, or in a tortilla or pita with tomatoes and tzatziki, or enjoy on top of a salad.